Satellite pictures of the Pakistani coast in February (left) and November 2010. There's a new island in the azure waters off Pakistan, but you might want to hold off on vacation planning: The tiny dot is a mud volcano that will likely disappear before it sees 1,001 Arabian nights. 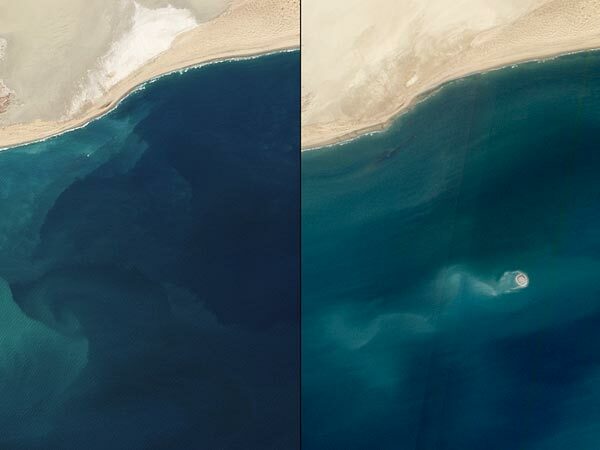 Pakistani fishers reported the new mud volcano in the Arabian Sea in late November, and NASA's Earth Observing-1 satellite snapped a picture of it (right) on January 11. The volcano was not in a satellite picture of the same region taken last February. According to NASA, mud volcano "islands" have appeared in the Arabian Sea before, and most have washed away within a few months. In fact, the January picture shows tan sediments steaming from the new mud volcano, suggesting it is eroding and will soon vanish. Mud volcanoes, which can appear on land or underwater, form when underground layers of silt or clay become pressurized either by tectonic activity or by a buildup of hydrocarbon gases. Pakistan's mud volcanoes are driven by plate tectonics: The Arabian plate is subducting—or diving under—the Eurasian landmass, churning up sediments that form Pakistan's coastal plains and an offshore slope. Underneath the plains, subduction is also melting rock into magma, which infuses the groundwater with heat and volcanic gases. The resulting acidic brew dissolves the rocks above into a slurry of mud and hydrocarbons, which then seeps through faults in slow eruptions. Most mud volcanoes stand only a few inches to several feet high, but the land-based ones on Pakistan's plains can rise up to 330 feet (100 meters). Some of these peaks have been known to spew gas plumes that spontaneously combust, sending tongues of fire high into the sky. At about two miles (three kilometers) offshore, the new mud volcano is probably poking up from water that's about 98 to 197 feet (30 to 60 meters) deep, said James R. Hein, a U.S. Geological Survey senior scientist in Menlo Park, California. Its surface mud is relatively cool but "is likely water-saturated, so stays gooey to souplike depending on the amount of saturation," Hein said. Like hydrothermal vents, underwater mud volcanoes—known as cold seeps—can have their own unique ecosystems filled with life-forms that get most of their energy from chemical sources, such as methane, he said. It's rare for such mud volcanoes to breach the water's surface, Hein added. The researcher isn't aware of any that have lasted long enough to support island living, although it's possible the mud contains some bacteria that thrive above the waves.